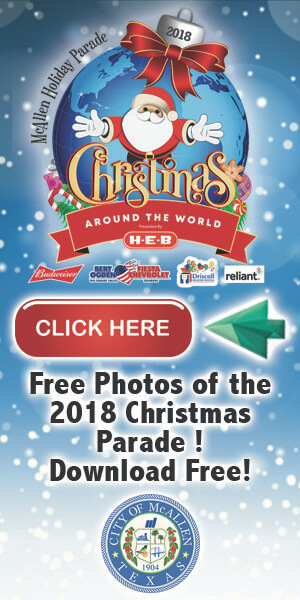 Given that the invitation came from Glen Roney and his wife, Rita, I was intrigued; they have been Texas Border Business friends for years. They shared with me the story of Eugene Gutierrez, Jr., who had fought during World War II. Glen and Rita have known Mr. Gutierrez for decades and felt that the odyssey of his service as a soldier was so unique that people would want to know more about him. The McAllen Independent School District announced that on October 19, 2018, during Friday’s football game between McAllen High School and Memorial High School, there was going to be a special presentation. 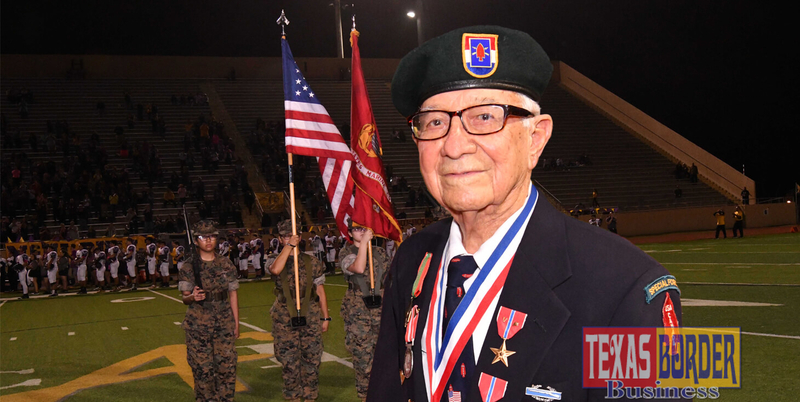 Every week before home football games, the McAllen ISD honors a Veteran of the Week right before the national anthem and kickoff. That week, the 97-year old World War II veteran who saw combat in Italy and France, as a member of an elite outfit known as the Devil’s Brigade, was honored. He was part of the first Special Service Forces (SSF) trained in every aspect to destroy the enemy, at that time Germany, the Nazis. That is how I came to learn about Eugene Gutierrez, born on September 14, 1921, he just turned 97 years of age. I was also told that Mr. Gutierrez is a 1941 Harlingen High School graduate and he served as a teacher and principal in McAllen ISD for 30 years before he retired around 1980. His wife of 66 years, Emma, or Penny as family and friends call her, was also honored. She was born in 1928 and is 90; she’s a retired registered nurse. They have lived in McAllen since 1950. 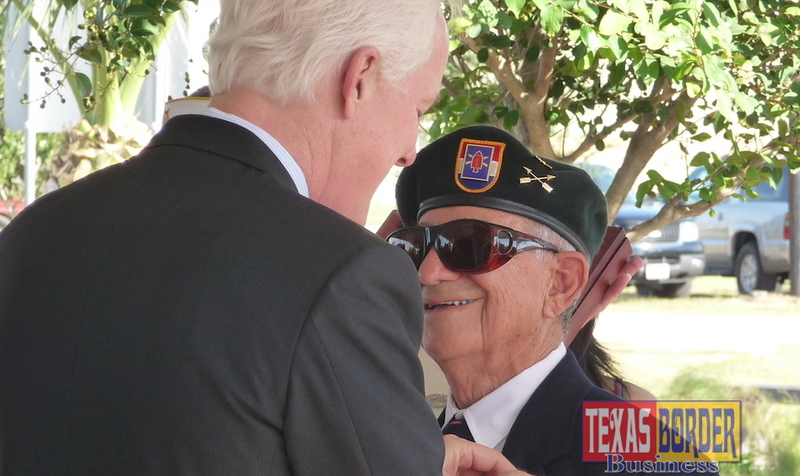 Sen. John Cornyn was honored to present Eugene Gutierrez his Bronze Star Medal in October 2008 and vote in support of his Congressional Gold Medal in 2013. “Men like Mr. Gutierrez exemplify why he’s so proud to represent the state of Texas,” Sen. Cornyn told Texas Border Business. What an honor to have met this hero, who also was among the First Special Service Force members to receive the Congressional Gold Medal of Honor. The ceremony took place on Tuesday, February 3, 2015; the U.S. House and Senate presented a Congressional Gold Medal in honor of ex-soldiers of the First Special Service Force whose bravery helped to liberate Europe and bring about the end of World War II. According to the U.S. Congress, this First Special Service Force called the “Devil’s Brigade” by the German opposition, was a unit formed in July 1942 that was comprised of 1,800 soldiers from the United States and Canada that was built on the bond between the two countries. The unit was the most successful and instrumental in targeting military and industrial installations during the war. Mr. Gutierrez said that the mission was so secret that only the highest-ranking military officers had knowledge of it. The plan called for the Forces to parachute into Nazi-held Norway, into Rumania’s oilfields, and Northern Italy, to destroy power plants, oil fields, and a heavy-water plant. Mr. Gutierrez, now a Congressional Medal recipient is proud to have trained and fought under the command of Lt. Colonel Robert T. Frederick, who became a brigadier general at age 36 and the youngest Major General at age 37. Gen.Frederick set off to recruit staff from American and Canadian volunteers for the Force, as well as finding a place for them to assemble and be trained. He started to look for soldiers with specific qualities; they needed men who had worked in outdoorsmen-type jobs, had been forest rangers, hunters, or lumberjacks and such. He told Texas Border Business that the General recruited 1800 combat troops, 900 from Canada and 900 from the U.S., plus 800 support troops. For the training camp, Gen. Frederick chose Fort William Healy Harrison near Helena, Montana, a State National Guard post for assembly and training because it was a remote, mountainous territory, very cold, and snowy in the winter. The quarters were built around the arriving volunteers as the old fort underwent transformation and expansion. Gen. Frederick brought experts to teach the officers and men how to use every type of weapon, including the enemy’s weapons. They became experts on demolitions; went into the mountains to train on skis and snowshoes and practiced amphibious landings; the General stressed the importance of physical stamina. His men slept in the snow without blankets and learned to go without sleep and on low food rations. Mr. Gutierrez got trained in all of these weapons and tactics. According to history, Winston Churchill is responsible for the creation of the Special Service Force. Early in 1942, he suggested the formation of a Canadian-American brigade to be known as “The North American Force.” Intensively trained in all fighting skills, this outfit was to engage in daring raids on strategic spots in occupied Europe. Eventually, this scheme came to the desk of Gen. Frederick, then a lieutenant colonel in the Army operations and planning section in Washington. The mission was full of challenges and to give you an example the paratrooper course had to be completed in six days. So, Gen. Frederick borrowed transport planes, got some parachutes and marched the outfit to the field. There, to convince his men that six days’ training was enough, he took a parachute course of about ten minutes’ duration, learning how to twist in the harness and roll to absorb the shock of landing. Then he went up in a plane and jumped. Mr. Gutierrez said that he joined the service onAugust 5, 1941, and when he was recruited by Gen. Frederick, he started training for the Special Forces in Montana in July of 1942. That intense special training was evident in Italy in 1943, when they were able to achieve in about four hours what the Fifth Army had not been able to do in weeks. Mr. Gutierrez was a tough, brave soldier; at 97, he has a tremendous grip that when he shook this reporter’s hand, he made me wince. I only thought of being more alert at the end of our conversation; I knew I had to shake his hand to say goodbye. I needed to make sure it didn’t happen again. So, I said to myself, be careful. “Besides, I exercise almost every morning. I have a routine that I invented, exercising made up of stretch, strength, cardio, and balance.” He continued, “That has given me longevity. The diet, my exercise, and my genes. The fourth one is my God, my Lord. That’s who I depend on.” Shouldn’t God be the first?“Yes, He is. I leave Him for the last, so I can stress on Him a little bit more,” he said. Mr. Gutierrez is proud to be an American and loves his country. “I’m proud that I can relate to God every day because when I left for the military, my mother gave me her rosary. And I took it, and the first time I was in combat I relied on it to keep my mind occupied, open, and my spirit strong.” He wore out about three rosaries during that time, not including the first one his mother gave him. So, yes, he is always in communion with God. 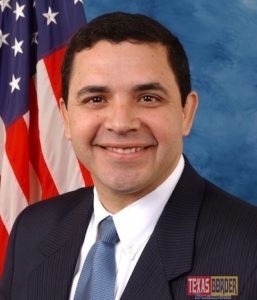 “Eugene Gutierrez is not only an American War hero but a hero in the field of education. McAllen ISD is blessed that Mr. Gutierrez served as a building principal on our team. 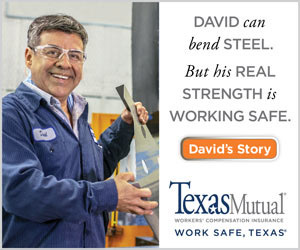 He played a tremendous role in the lives of many McAllen ISD students. 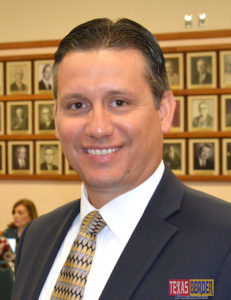 Mr. Gutierrez left a legacy of excellence that we can all be proud of.” – Jose Gonzalez, McAllen Superintendent. What was your classification with the army?“I was an enlisted man, and we didn’t have too many promotions in my unit until I got out.” His unit was active from July 1942 until December 1944, and his decorations are 2 Bronze stars; a liberation of France medal, a Combat Infantryman’s Badge, and just recently he was awarded the Congressional Gold Medal of Honor. As the tank continued to attack, Gutierrez found cover in a farmhouse. This time, he had to use his body to shield an injured soldier’s gut wound. Fortunately for him, three North American P-51 Mustang fighter planes came to their aid. “I gave this information to my granddaughter, as she was working on an assignment in high school in Monrovia, California; they had to come up with a story about a veteran. So of course, she selected me right away,” he said. The Congressional Gold Medal is the highest civilian honor the United States Congress can bestow. Under H.R. 3249, a single gold medal has been struck by the U.S. Mint and awarded to members of the First Special Service Force as an entire unit in a ceremony on February 3, 2015, to honor their distinguished service.